I had a vision! In 2014 I created a design and built a 3D Wave/Surfboard Shadow Box to be used at thesimplechurch.tv for their Easter Summer Themed Services at CenturyLink Center in Bossier City, Louisiana. It was also used the following Sunday, for the appearance of Bethany Hamilton and her husband’s testimony at two Sunday services and the Children’s Summer Program. At the age of thirteen, Bethany lost her left arm to a 14-foot tiger shark, which seemed to end her career as a rising surf star. 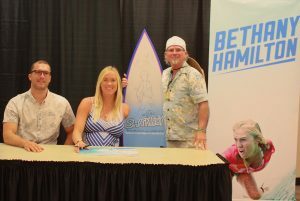 One month after the attack, Bethany returned to the water and within 2 years had won her first National surfing title. Since that day in 2014, more than 14,000 people have viewed the WAVE, with more than 3,000 adults and children “riding” the surfboard while having a cherished photo opportunity. After seeing the joy that the WAVE gave, I had a vision! My heart’s desire is to bring a smile and joy to the hearts of children and adults, including those who have special needs or are hospitalized. So, I started Opp Art Box to create a traveling experience that groups, churches, schools…anyone can use to enhance their event and capture the smiles of their attendees. 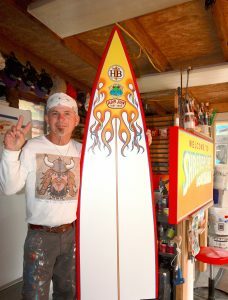 Opp Art Box began with the creation of the WAVE RANGER (which includes a 3D Wave, Surfboard and Dolphin) and was completed with the addition of the BAYOU TIGER (which includes a 5 foot Tiger in a stadium background on astro turf). These larger than life-size structures can be scheduled for any event with pricing based on the scheduled time and availability. It is important to me that my work honor those who have had a profound effect on my life. In 2006, Nolan Hunter Johnson, grandson of my dear friends in Alburquerque, New Mexico, had his first Cancer surgery to remove his left lower leg. Nolan left this earth in 2010 after three major cancer surgeries, two days before his 6th birthday. He wanted to be “SHARK BOY” the last two weeks of his life on this earth. So, with the drawing done by Nolan, I created the design of Nolan as Shark Boy. My friends’ son, Eric Johnson (Nolan’s father), left this earth in 2014 after battling Metastatic Melanoma Cancer. So, I dedicated the Viking at Airline High School, “Eric the Warrior” on the right of my wall art project in 2014 to a “Great Warrior” and my best friends’ son. Since I have been given a Gift from GOD, I have been able to make a living with my Artistic Talents, and now I feel it is time to give back what GOD has given me!